Check for injuries. If anyone is injured, call 911. If no one is injured and the vehicles are drivable, move them out of traffic to the side of the road or into a parking lot then continue to Step 4. If injured , remain on scene. Exchange information with the other driver(s): name, address, telephone number, name of insurance company, vehicle license plate number, make, model, and color of their vehicle, etc. Get witness information if possible (names, addresses, phone numbers). Once you have done all of the above, police are not needed to respond and you are free to leave the scene. Within 24 hours of the crash, contact your insurance company. If someone was injured in the crash, or if it turns out that there is over $750 damage to any one vehicle, you must submit a crash report to the Nevada Department of Motor Vehicles or to the police department. 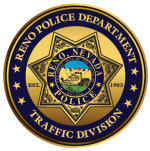 In order to report the crash through the Reno Police Department’s on-line reporting system, click the On-Line Traffic Crash Report link below. You can also obtain forms from the police officer at the scene, at any DMV office, or at a police station or substation. Click the DMV Crash Report Form Link below to bring up the PDF form to download and complete for the State of Nevada DMV. The Traffic Division is committed to enhancing traffic safety for our community through education, enforcement and engineering. The Reno Police Department's Traffic Division is comprised of 25 sworn officers which consists of: 1 Lieutenant, 2 Sergeants, 12 motorcycle officers, 6 crash investigators, 3 DUI officers, and 2 Detectives. View a map of the designated City of Reno portal locations. View the U.S. Forest Motor Vehicle Maps. Under the direction of the traffic lieutenant, the traffic sergeants supervise traffic crash investigations, enforcement activities, grant operations and service requests from the public. The twelve officers assigned as motorcycle officers are responsible for enforcing traffic laws, identifying high crash locations within the City of Reno, and working proactively to reduce crashes and traffic fatalities. These officers must pass an intensive 80-hour motorcycle training course, as well as a 240-hour Field Training Program. Additionally, motor officers are an important part of the City's special events, due to their maneuverability in heavily congested areas and traffic control experience. Many of our traffic officers have collateral duties including firearms instruction, defensive tactics instruction, and SWAT. Motorcycle officers and crash investigators are assigned to work both day and swing shifts covering the hours of 6:00 AM - Midnight. Six crash investigators are assigned to investigate property, injury, and fatal traffic crashes, including hit-and-run crashes. They drive vehicles equipped with specialty equipment for the investigation of crashes. Within the division is a specialized Major Crash Investigation Team (MCIT) which is responsible for investigating all crashes involving a fatality and/or a major injury. Investigators assigned to this team receive training in basic and advanced crash investigation, crash reconstruction, and interview and interrogation techniques. The Traffic Division’s two detectives are assigned to investigate traffic crash reports submitted by the public, including hit and run crashes. They also conduct investigative follow-up from cases taken by officers in the field and are members of MAIT. Three DUI officers are assigned to patrol the City and enforce drunk-driving laws, primarily through enforcement. Although they work late evening to early morning shifts, they occasionally adjust their schedules as the need arises. DUI officers drive vehicles specifically equipped to assist in the detection and apprehension of those driving under the influence. Have you noticed that vehicles traveling through your neighborhood routinely exceed established speed limits? The City of Reno welcomes calls from citizens that pinpoint areas where posted speed limits are continually violated. The City also welcomes calls concerning abandoned vehicles parked on a public street. A vehicle is considered to be abandoned if it has been parked in the same spot on the street for over 48 hours. When you call regarding an abandoned vehicle, have available the location of the vehicle, a vehicle description, and the vehicle license plate number, if there is a plate on the vehicle. For these traffic-related complaints, call RENO DIRECT at 775-334-4636 (INFO). Click below to download and print out brochures in either English or Spanish to assist you if you are stopped for any reason by a Law Enforcement Officer. The Nevada Revised Statutes (NRS 484B.157) requires that any child under the age of six and less than 60 lbs. be buckled up in an approved child safety seat. Each month, REMSA hosts "Point of Impact," which is a child safety seat and inspection program. Go to the REMSA website for a schedule. Always walk on the sidewalk. If there is no sidewalk and you have to walk in the road, always walk FACING traffic, so you can see any vehicle that is approaching and spot a vehicle that is being driven erratically or that might be out of control. Dress to be seen. Brightly-colored clothing makes it easier for drivers to see you during the daytime. At night, you need to wear special reflective material on your shoes, cap, or jacket to reflect off of the headlights of vehicles coming towards you. Cross only at corners or in marked crosswalks. Stop at the curb, or at the edge of the road. Look left, then right, then left again before you step into the street. If a car is parked near where you are crossing, make sure there is no driver in the car that may suddenly pull out in front of you. Then, if the parked car is in your line of vision, go carefully to the outside edge of the car and look left-right-left until no cars are coming. Always keep looking for cars while you are crossing. They can appear out of side streets, from parking spaces or from around corners very quickly. Walk--don't run. If you try to outrun an approaching vehicle, you will lose. Also, you may fall down in the process. Always hold a child's hand when crossing the street. If crossing with more than one child, be sure they also hold each other's hands. Children are unpredictable and may run ahead into the street or lag behind if you are not holding on to them. Always cross at a crosswalk or an intersection, and use pedestrian signals when available. Children learn by what they see you do, not by what you say. If they see you crossing streets safely, they will learn to do the same. If you can't be bothered with crossing safely and using crosswalks, they will pick up your bad habits and ignore crosswalks just like you do. In the state of Nevada, a blood alcohol content of .08 or above is considered impaired, and legally drunk. According to the National Highway Traffic Safety Administration (NHTSA), all 50 states have now passed .08 BAC laws for impaired driving. A NHTSA study shows nearly 97% of Americans view drinking and driving by others as a threat to their families and themselves. The study found Americans rank drunk driving ahead of healthcare, poverty, the environment and gun control as an important social issue. The majority of Americans support increased enforcement efforts, according to the NHTSA. National statistics show 40% of those killed in auto crash are involved in alcohol related crashes. Plan ahead! If you plan to drink, choose a designated driver or plan to take a taxicab or a driving service to get home. Plan to spend the night where the activity is held. Serve non-alcoholic beverages at your gathering. Report impaired drivers immediately to your local law enforcement - call 911. When turning from one roadway onto another, you must complete the turn into the nearest lane possible. Do not turn into a different lane from the one you left when you turned. If you need to end up in a different lane, put on your turn signal, and cross into another lane when you know it is safe to do so. Drivers often follow other cars too closely because they are in a hurry or because they misjudge their ability to react or stop their car if they suddenly need to. Did you know that even if you equip your car with a headphone device to allow hands-free cell phone use, you are still more likely to have a crash. Why? Because you are still being distracted by the phone conversation. Instead of paying attention to your driving, you may instead be discussing the stock market or finding out what a family member wants for dinner. This is still a major driving distraction. Some drivers always follow other cars too closely. For them, tailgating is just a bad and a dangerous habit. Did you know that habitual tailgaters have to get their brakes fixed twice as often as other drivers? Since they feel compelled to remain right behind the car in front of them no matter what the circumstances, they must continually apply their brakes to keep from hitting the car in front. If they would just ease up and leave four or five feet of room in front, they generally would not have to apply their brakes much at all while their car is in motion!! Brake Repair Shops love tailgaters--they help keep their shops in business! Tailgating is also costly. Potential fines and court fees for Following Too Closely and/or Duty to Decrease Speed are in the hundreds of dollars. Add to this the cost of having a crash and having to pay a deductible for car repair and then having your auto insurance company raise your rates because you rear-ended someone. The rule of thumb is allow 2-4 seconds of space between you and the vehicle in front of you. This distance should increase as your speed does. Do you know what the traffic rules are if you reach an intersection where the traffic signals are not working? Due to power failures, servicing, and other causes, especially during inclement weather, traffic signals sometimes lose power. Sometimes they are totally dark, sometimes they will just flash red in all directions. When this happens, the intersection must be treated as if it is a four-way stop and as if there are STOP signs at each street leading to the intersection. At a four-way stop, all vehicles stop, and then proceed in turn based on who arrived at the intersection first. If two or more cars all seem to have arrived at the same moment, the car on the right goes first. At a major intersection, vehicle traffic should alternate as much as possible, so that traffic in all four roads, even if two of the roads are smaller, get an equal chance to get through the intersection. Above all, proceed through the intersection slowly, just in case another driver is not as cognizant of the rules as you are. Summer is over, the leaves have fallen, and winter weather is on its way. Winter in Reno is beautiful to look at but it can be treacherous to drive in. Winter driving requires special preparation and special skills. The following driving tips can help you to get safely to your destination. 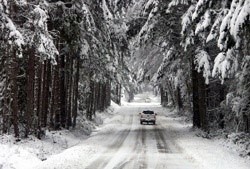 Prepare your vehicle and yourself for winter driving. Snow Tires and Chains - All-season tires on a vehicle are a compromise and will not perform as well as snow tires in winter conditions. To maximize safety and control, use the best snow tires available. If you must travel in mountain areas, carry chains and know how to install them and safely remove them. Battery - Cold-weather starts require a battery that is fully charged. Recharge or replace a weak battery. Have your charging system checked too. Ignition System - Damaged ignition wires or a cracked distributor cap may cause a sudden breakdown. Cold-Weather Gear - It is wise to carry some personal cold-weather gear in your vehicle in winter. Throw some old boots, warm socks, scarves, heavy gloves, a ski hat, and an extra heavy jacket in the trunk just in case. You may leave your driveway on a winter day with the sun shining brightly, so you have decided to just throw on a light jacket. The Sierras can create inclement weather without notice in the Reno area. If you do get stuck someplace, or even if you have a minor crash but still must leave your vehicle and perhaps walk for a while, those heavy old winter clothes will come in handy. Before You Leave Your Driveway - Warm up your vehicle. A warm engine responds better than a cold, sluggish engine. 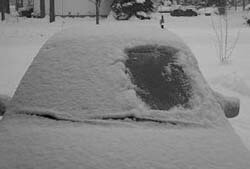 But, do not leave your car unattended when you warm it up. Not only is this illegal, but it increases the chance of your car being stolen. Did you know that stolen vehicle reports increase as the weather gets colder? Why wouldn't they? Not only have you conveniently left your vehicle with the key in the ignition for a thief, you have also warmed the car up so the thief won't get cold when he or she jumps in and drives away -- how accommodating you are! It's hard to believe that someone thinks they can drive safely having cleared this much space from their window, but officers see people driving like this quite often in the wintertime. This is not only illegal, it's not too bright. Get up ten minutes early if you have to in order to have time to clean off your vehicle before you leave. When driving in challenging conditions (rain, snow, ice) slow down. Slower speeds allows more time to respond to emergencies. To determine a safe speed for your vehicle, consider the vehicle type, the quality and tread wear on your tires, your driving ability, and alertness. Use traction effectively when roads are slippery. Brake only when you are traveling in a straight line. Taking your foot off the brake before you steer into a curve allows you to use all of your available traction for steering. 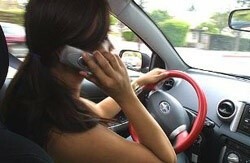 Don't accelerate again until you begin to straighten the steering wheel when you have completed the turn. This technique will keep your vehicle straight and level for a longer period of time and will help you to drive more effectively on winter roads. Don't be overconfident. Driving conservatively or cautiously is the best way to avoid a crash, in winter or in summer. Remember that even though four-wheel drive vehicles provide better traction, their braking characteristics in ice and snow are the same as they are on any vehicle; four-wheel drive vehicles can lose traction and slide just the same as any other vehicle.